Rain ravaged the second day of Festival Santa Teresa, which shuttered the outdoor main stage for most of the afternoon, resulting in many delays and cancellations. 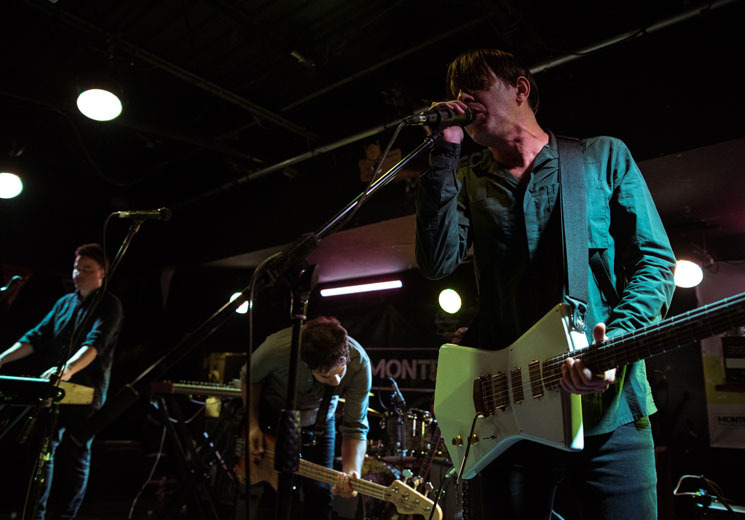 While some, like the Voidz and Alice Glass, were unable to reschedule their sets, Wolf Parade, with the determination and grit of the indie rock veterans they are, simply picked up their gear, marched to the nearest venue and, after a quick soundcheck, delivered a set that harkened back to their early days. Le Montecristo, a small dive bar filled with pool tables and cheap beer, is the kind of venue they'd have played early in their career, some decade-and-change ago. The band fit the vibe perfectly, treating the few lucky festival goers to a vintage Wolf Parade set. Raw displays of ragged emotion is Wolf Parade's MO, and it was on full display — the band's hunger for a good show was amplified by the situation and magnified by the intimate space. The set was heavy on tracks from the band's breakthrough debut, Apologies to the Queen Mary (to keep with the throwback vibes) and last year's reunion LP, Cry Cry Cry (because, uh, it's new and they were there to promote it), demonstrating how the new record fit seamlessly into the band's discography. Following experimental and progressive turns on their second and third records (which contributed merely a single track to the set, "What Did My Lover Say?" from 2010's Expo 86), Cry Cry Cry marks a return to the straightforward, anthemic rock that Wolf Parade built their success on, featuring the most methodic builds and explosive climaxes of their careers since. Hearing the new tracks in such an intimate space only served to remind how well the band handle tension and release. The finale of Cry Cry Cry track "Weaponized," though far slower than the band's Apologies anthems, felt just as triumphant as the record's best. Though Wolf Parade are largely seen through the dichotomies of their two frontmen, arty experimentalist Spencer Krug and howling rocker Dan Boeckner, the intimate set uniquely showcased how potently multi-instrumentalist Dante DeCaro and drummer Arlen Thompson fit into the equation. The interplay between DeCaro and Boeckner's duelling guitar lines drove tracks like Apologies classic "Fancy Claps" and Cry Cry Cry cut "Baby Blue," while Thompson's propulsive backbone kept the energy up from start to finish. It was a surprising turn of events that got everyone to the bar, but Wolf Parade handled the curveballs effortlessly, delivering a far-too-rare experience to the dedicated. The band's scrappy underdog spirit still resides in the now-polished quartet, and it was a treat to see it unleashed once again.